Be the first to share your favorite memory, photo or story of Ilse. This memorial page is dedicated for family, friends and future generations to celebrate the life of their loved one. 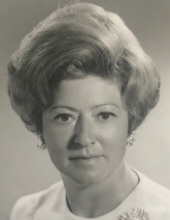 Ilse Agnes Riedesel-Dickerson, 94, passed away on Sunday, February 3, 2019. She was born on November 19, 1924 in Switzerland. She was the eldest daughter of Wilhelm and Katharina Riedesel and the widow of George E. Dickerson. Born in Switzerland, she was a native of Germany and met her future husband while working for the American Military Government after the end of WWII. She came to the United States as his bride in 1953 and to Frankfort in 1956. During the following years she worked for attorneys Dailey & Fowler, and later as secretary to Attorney General Jo M. Ferguson, and then as chief clerk for the Budget Division in the Department of Finance. Beginning in 1963, she lived almost 10 years in three African countries: South Africa, Libya, and Zambia, where George, as a Foreign Service Staff Officer, was posted by the US Department of State to the embassies in those countries. After he retired in 1972 it was back to Kentucky. She returned to work in 1975 as secretary to the Executive Director of the Board of Claims and the Crime Victims Compensation Board. In 1979, she was appointed to the Executive Director’s position where she worked until she retired in 1989. She enjoyed needlepoint and cross-stitch embroidery, reading, traveling, and bridge. She learned to do batik work in South Africa and some of her work was shown at exhibits in Pretoria, Libya, and Louisville. She was preceded in death by her parents, her husband, and her sister and brother-in-law, Anneliese and Herbert Lemson, Law Vegas, Nevada. Survivors include her son, William A. (Ellen) Dickerson, Frankfort; two daughters, Catherine Anne (Thomas S.) Mullins, Harrodsburg, and Leslie Ann (M. Douglas) Harrod, Pleasureville; grandsons, Austin D. Harrod, Pleasureville; Colin A. Bussell, Lexington, and Ryan Bussell, Frankfort; niece, Josie Erickson, Big Sky, Montana; niece, Honey Granito, Las Vegas, Nevada; and nephew, Keoki Lemson, Honolulu, Hawaii. Visitation will be held from 10:00am until 12:00pm on Wednesday, February 6, 2019 at Clark Legacy Center, Versailles Rd. Private interment will be held at Resthaven Cemetery. In lieu of flowers, memorial contributions may be made to Hospice of the Bluegrass. To send flowers or a remembrance gift to the family of Ilse Agnes Riedesel-Dickerson, please visit our Tribute Store. "Email Address" would like to share the life celebration of Ilse Agnes Riedesel-Dickerson. Click on the "link" to go to share a favorite memory or leave a condolence message for the family.